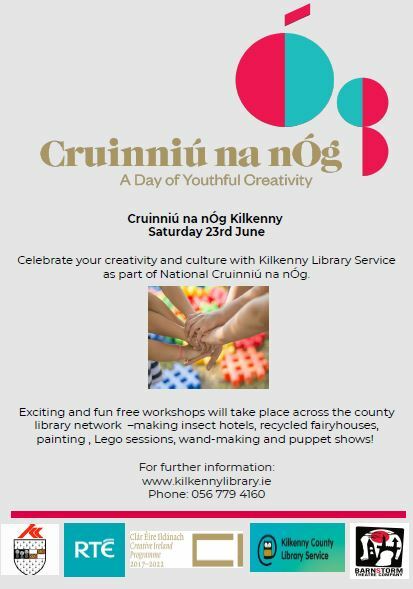 Cruinniú na nÓg is a new national day of creativity for young people taking place on Saturday, June 23rd with an exciting line up of over 20 free events across Kilkenny Library Service, Barnstorm Theatre and the Design and Crafts Council of Ireland in the Castle yard. The programme will be free and activity-based, with plenty of opportunities for young people to actively participate and explore their creativity. This is a Creative Ireland initiative Department of Culture, Heritage and the Gaeltacht and is presented in partnership with RTÉ and the Local Authorities. See the full programme of events for Kilkenny on www.kilkennylibrary.ie or download the programme here: Criunniú na nÓg Kilkenny Programme.pdf (size 911.5 KB).